plan. In fact, many insurance companies require it. will provide a quote within 24 hours and a detailed report within 24 hours of scanning. Unchecked, unidentified equipment faults can lead to equipment failure, loss of electricity supply or electrical fire. Thermography can detect equipment faults not visible to the naked eye and is an effective method for finding problems before they become dangerous – and costly. 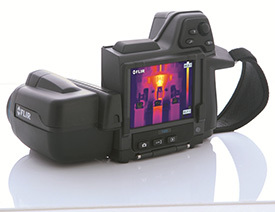 It’s become commonplace for insurance companies to recommend thermal imaging being completed annually. At Thermoscan, we analyse your equipment, but don’t have the conflict of interest of fixing faults we find. You know we provide unbiased, professional advice – with no hidden agenda – of finding faults that need our professional attention. Our themographers are highly trained electricians with Level 1 or 2 thermography qualifications. You know you’re working with a professional who has your best interests front and center.